Compare frozen meals from ALDI, Coles, Woolworths, Lean Cuisine, McCain, On the Menu and Weight Watchers on taste & quality of ingredients, value for money, dietary considerations, variety of meals, ease of preparing and overall customer satisfaction. 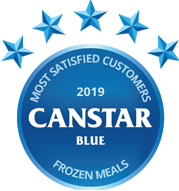 In the first Canstar Blue awards for frozen meals, ALDI International Cuisine has cooked up a treat, with five stars for taste & ingredients, value for money, dietary consideration, ease of preparing and overall satisfaction. Sometimes cooking dinner is the last thing you want to do after you’ve come home from a long day. And while the allure of takeaway food is ever-present, the cost – as well as the guilt – associated with greasy fast food can quickly make dinner time a bigger decision than expected. Thankfully, hungry Aussie households have plenty of other convenient options available, with the frozen food aisle of your local supermarket packed with plenty of dishes and comfort foods, whether it’s to feed a small army, or a meal for just one. But not all frozen meals are created equal. Sure, they’re generally cheap and cheerful, but that doesn’t mean you should settle for average. That’s why Canstar Blue has produced its first consumer review of frozen meals to find out which brands are serving up a treat based on factors like taste & ingredients, variety and value for money. ALDI takes out the award with five stars across most research categories. It’s the latest in a long line of success for the discount supermarket chain when it comes to groceries. Supermarket rivals Woolworths and Coles both achieved four stars for overall satisfaction – along with On the Menu and Lean Cuisine. It was three stars for McCain and Weight Watchers. No stranger to taking on and beating the big brands, ALDI’s International Cuisine range includes a variety of meals for the dinner table. Meals such as beef stroganoff, chicken risotto, chilli con carne, lasagna, yum cha, classic chicken parmigiana, and veggie options such as vegetable cannelloni, are all available at your local ALDI in the freezer section. 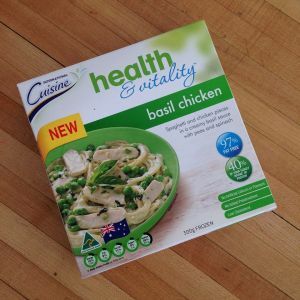 The range includes ‘Health & Vitality’ options like the basil chicken meal pictured, courtesy of ALDI Mum. This particular dinner is said to be 97% fat free! Rated five stars across the majority of categories, including taste and quality of ingredients, value for money, dietary considerations, ease of preparing and overall satisfaction, ALDI was also rated four stars for its variety of meals. Operating under the Vesco brand, On the Menu offers plenty of frozen meal options, regardless of what you’re craving. With a range that consists of King Size Power Bowls, for those looking for a higher protein intake, to the Pub Favourites range, which includes crowd pleasers such as chicken Kiev and fish and chips, On the Menu also offers family-sized lasagnas and single-serve pies for those in a hurry. Competitively priced, the Pub Favourites range will set you back $6 per packet, while the Power Bowls will cost you $7.50 at the checkout. If you’re looking to stick to a diet, On the Menu also offers the nutritional information of all its products via its website, making it easy to plan what’s for dinner. With a five-star rating for taste and quality of ingredients, plus ease of preparation, On the Menu got four stars for value for money, variety of meals and overall satisfaction, with a three-star rating for dietary considerations. 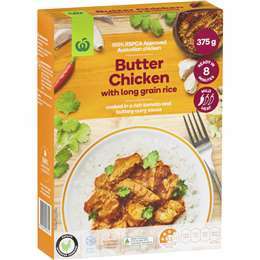 Not to be outdone on supermarket shelves, Woolworths offers a number of meals for shoppers to choose from, including chicken satay, Thai green curry, carbonara, as well as chicken and mushroom risotto. Each will set you back $3 per 375g packet, making it one of the cheapest options available for those looking to stock up on convenience meals. While it scored four stars across most categories, including value for money, dietary consideration and overall satisfaction, Woolworths scored three stars for its variety of meals available. One of the heavyweights of the frozen meal market, Lean Cuisine looks to provide shoppers with a variety of healthy meals, offering the Balance, Steam, Wholegrain, and Classic ranges. Lean Cuisine also provides the ingredients lists and nutritional information of its menu online, making it easier to decide which pack to pick up at the supermarket. The Balance range includes meals such as beef stroganoff, chicken and vegetable risotto, honey soy beef, spaghetti Bolognese and satay chicken noodles, each coming in a 280g-300g pack. The Steam range brings satay beef, Indian butter chicken and slow cooked beef pasta, coming in 350g-390g packs. 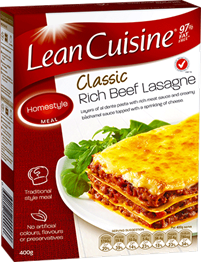 For something a bit more traditional, Lean Cuisine’s Classic range includes beef lasagna, chilli con carne and vegetable cannelloni, coming in 350g-400g packets. Most meals will cost you between $5 and $7, depending on your local supermarket and which range you decide to pick up. Rated four stars for overall satisfaction, dietary considerations, variety of meals available and ease of preparing, Lean Cuisine got three stars for taste and quality of ingredients, as well as value for money. 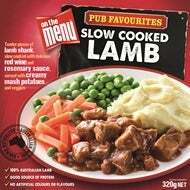 Like its supermarket rivals, Coles has its own range of frozen meals to help consumers find a convenient option for dinner, at affordable prices. Offering a wide range to suit your cravings, meals include classics like lasagna, tuna bake, satay chicken, macaroni and cheese, and shepherd’s pie, with Coles additionally offering gluten-free and vegan options. Each meal costs between $2-$4 depending on what you’re picking up, making it one of the cheapest options available for filling up the freezer. 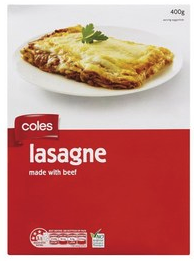 Coles got four stars for taste and quality of ingredients, value for money and overall satisfaction, but just three stars for dietary considerations, variety of meals and ease of preparing. McCain has one of the largest ranges of frozen meals on offer, including the Healthy Choice, Hearty Meals, Wholegrain, Man Size and Slow Cooked varieties available at your local supermarket. 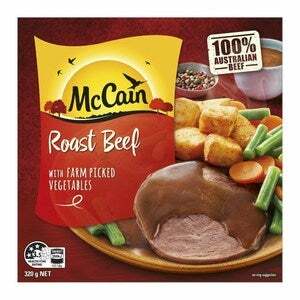 The ingredients and nutritional information are also available on the McCain website, along with cooking instructions to help you plan dinner down to the minute. With the ‘Healthy Choice’ range, you can choose from honey stir-fry chicken, creamy chicken carbonara, spinach and ricotta ravioli and Thai green curry, while the ‘Hearty Meals’ range consists of classics such as chicken parmigiana, lasagna, roast beef, spaghetti bolognese, and pork riblets. A Wholegrain meal range is additionally available, along with Man Size and Slow Cooked options, giving shoppers plenty to consider the next time they’re in the frozen food aisle. With the only five-star rating for variety of meals available, McCain was rated four stars for taste and quality of ingredients, and ease of preparing, but just three stars for value for money, dietary considerations and overall satisfaction. While it may be better-known for its weight loss plan and community, if you’re looking for the occasional convenient meal and aren’t interested in signing up to Weight Watchers, you can still pick up a few frozen meals at your local supermarket. Meal options include lasagna, beef cannelloni, cottage pie, creamy tuna bake, and chicken and mushroom fettucine, all of which cost between $4 and $6.50 depending on which meal you pick up. 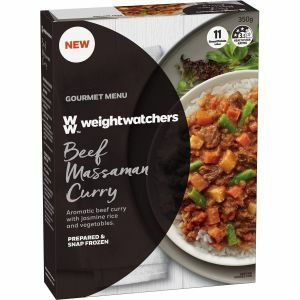 Each pack shows the SmartPoints value used by Weight Watchers, meaning you can still get an idea of how meals compare even if you’re not signed up to the full Weight Watchers service. Rated three stars for taste and quality of ingredients, value for money, variety of meals available and overall satisfaction, Weight Watchers scored four stars for dietary considerations and ease of preparing. Which frozen meals should I buy? With plenty of options available for your next grocery shop, figuring out which brand to scan through the checkout will ultimately come down to your personal preferences, including what you’re craving, if you’re gluten-free or vegan, as well as how much you’re willing to spend for the convenience of a frozen meal. It might seem like price relates to quality when it comes to frozen meals, but our ratings suggest shoppers are just as satisfied with the supermarket labels as they are the big-name brands – even more so when it comes to ALDI. While they may certainly be convenient, subbing frozen meals for cooking may end up costing you in the long run, so it’s important to shop around to ensure you’re getting the best deal. Canstar Blue surveyed 3,104 Australian adults across a range of categories to measure and track customer satisfaction, via ISO 26362 accredited research panels managed by Qualtrics. The outcomes reported are the results from customers within the survey group who have purchased and eaten a pre-made frozen meal (i.e. from the frozen section of the supermarket) in the last six months – in this case, 835 people.